Wendy Tyson wrote her first story at age eight and it’s been love ever since. When not writing, Wendy enjoys reading other people’s novels, traveling, hiking, and playing hooky at the beach – and if she can combine all four, even better. Originally from the Philadelphia area, Wendy has returned to her roots and lives there again with her husband, three kids and two muses, dogs Molly and Driggs. She and her husband are passionate organic gardeners and have turned their small lot into a micro farm. Killer Image is Wendy’s first novel in the Allison Campbell mystery series. 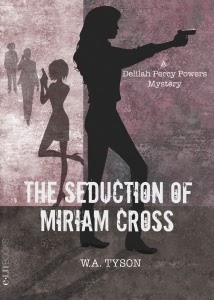 The Seduction of Miriam Cross is her first Delilah Percy Powers mystery. Wow this sounds amazing! I love these kinds of books! first thought on cover? "killer girls"!!! :) Thanks for sharing!